This is being launched on Tuesday by organisers The Albany, Entelechy Arts and Lewisham Council. Grants of up to £2,000 will be available to stage your own events and projects as part of the festival. Organisers ill also match groups with local artists and support the planning of events and writing grant applications. It’s a crowdfunding platform for projects that improve spaces and places. They are currently looking for local projects in London to be part of Crowdfund London 2018. This is a £1m fund on Spacehive, from which the Mayor of London could pledge up to £50,000 per project. If you are working on a project that will improve your local area, or know anyone who is, do contact the Spachive team. 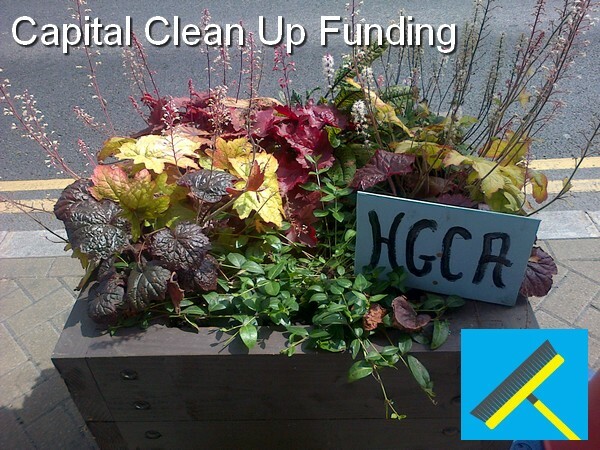 Capital Clean Up Funding: Improve your street with trees, flowers, murals & benches! Capital Clean-up is the Mayor of London’s partnership campaign to help Londoners get together to spruce up their city. Community groups, charities, small businesses and schools can apply for a grant of £500-£1,500 to help you run local clean-up events. You can now apply to run Capital Clean-up activities on your street this summer. Whether you want to turn a neglected green space into a community garden, remove litter from a beauty spot, clear up a waterway or paint vibrant murals on a graffiti covered walls, Capital Clean-up can help. The scheme mainly pays for materials and equipment costs. Ideally, they look to fund projects which benefit both the environment and local community. Projects which improve an area in the long-term will be looked upon favourably. Download a grant application form and guidance notes on applying. These kits have all you need from litter-pickers, to hi-vis vests, rubbish hoops, gloves and a £50 DIY voucher. Download a kit application form. The deadline for applications for grants and kits is 5pm, Monday 16 March 2015. If you’re planning a clean-up event read our advice and help page for tips. To find out what happened in 2014’s Capital Clean-up, watch the below film, read case studies and blogs. The Hither Green Lane Planters funded by Capital Clean Up. Hither Green Volunteers Clearing Up Nightingale Grove! Capital Clean-up funding for improving your neighbourhood. Application Deadline March 24th! Capital Clean-up grants of up to £1500 and FREE clean-up kits are still available to constituted groups and informal groupings of friends and neighbours who wish to improve their streets. The grants can pay for plants, building raised beds, painting, jet washing graffiti, murals, generally making improvements to an otherwise neglected space. *Grants of up to £1500 and FREE starter kits are on offer to community groups and local businesses who want to join Capital Clean-up this summer. *Constituted groups can apply for both grants and kits, groups that are not constituted can apply for kits only. *Clean-up activity has to take place between May – August 2014! Deadline for applications: March 24 2014! *Clean-up Kits to support groups that want to tackle littering issues in a particular space, which includes enough kit for 10 people (including litter pickers, high-vis vests, gloves, hoops and refuse bags) and £50 homebase vouchers for some planting or painting. Lewisham Central Ward Community First has extended the deadline for applications to its funding programme. The extended deadline for applications is 19 January, 5pm, 2014. To apply for funding from Lewisham Central Ward Community First, please complete the Lewisham Central Ward Community First application form (download here) and return it, via email, to the Lewisham Central Ward Community First Panel. Please ensure that your project meets the priorities identified in the Lewisham Central Ward Community First Plan (download here ). Funding will be awarded for projects up to one year between April 2014 and March 2015. You can apply for a grant of between £250-£2,500. Your project must be located in the Lewisham Central Ward. Only non-profit organisations and community groups may apply. For full details, including the application form and Community Plan, please go to our website here. The Lewisham Central Ward Community First Panel are happy to answer any queries and to discuss projects in advance of submission. Please contact us at info@lewishamcentralcommunityfirst.org. We welcome new panel members too – do get in touch if you are interested! Communities across the UK can get from £500 – £5000 of funding to create their own Grow Wild community site – deadline for English, Welsh and Northern Irish applications is 6 January 2014. Get creative and use your skills to transform a space in your community into a wild flower talking point? Turn your street into a hive of colour and sow a haven for local bees? Or get together and do something more unexpected? We would love to see! Get your friends and neighbours involved – with a little help from Grow Wild – and do something positive for your local area, and have lots of fun doing it. For more information about Grow Wild, please check out our funding page to find out who can apply, what we’re looking for and important dates for your diary. Central government has awarded Lewisham Central extra funding of £33,900 over four years. A panel was set up in April 2012 and has already allocated funding to various groups. The organisations have to match the funding with their own fund raising or volunteer hours.